If you're flying to Central Florida, please check the NOTAMs immediately before departure. 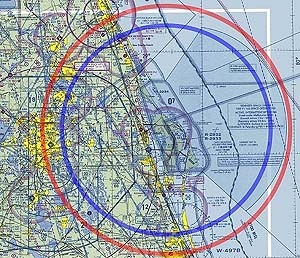 The entire area (including MCO, MLB, COI, and X59) is frequently subjected to large TFRs (40nm radius) and the activation of restricted areas associated with Space Shuttle and unmanned launch operations at Kennedy Space Center (KSC) and Cape Canaveral Air Station (CCAS). The restricted zones are monitored closely and they are prepared to shoot down intruders if necessary. "Typical" (inadvertent) violations of the restricted areas typically result in the suspension of flying privileges for at least 5 months... this is not a good way to make more time to build an airplane! Note that ATC is not responsible for alerting you about nearby TFRs. Since many pop-up TFRs are created with little notice (at the demand of entities such as the US Secret Service, DOD, and DHS) your controller may not even be aware of all active TFRs in your area. Always check for NOTAMS and TFRs right before takeoff! Steen Aero Lab takes pride in providing accurate and helpful information to our customers. We encourage you to make this website your first stop when you need answers about our products or services. If you can't find the information you need here, or if you have additional questions, please feel free to contact us directly! Normal business hours are 8:00 AM - 5:00 PM (0800-1700 hours) Eastern Time, Monday through Friday. We are closed on major holidays.